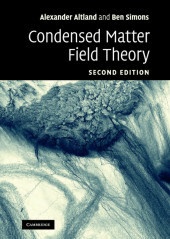 A pedagogical introduction to quantum field theory in many-particle physics, this book complements graduate level courses on many-particle theory. Modern experimental developments in condensed matter and ultracold atom physics present formidable challenges to theorists. This book provides a pedagogical introduction to quantum field theory in many-particle physics, emphasizing the applicability of the formalism to concrete problems. This second edition contains two new chapters developing path integral approaches to classical and quantum nonequilibrium phenomena. Other chapters cover a range of topics, from the introduction of many-body techniques and functional integration, to renormalization group methods, the theory of response functions, and topology. Conceptual aspects and formal methodology are emphasized, but the discussion focuses on practical experimental applications drawn largely from condensed matter physics and neighboring fields. Extended and challenging problems with fully worked solutions provide a bridge between formal manipulations and research-oriented thinking. Aimed at elevating graduate students to a level where they can engage in independent research, this book complements graduate level courses on many-particle theory. Preface; 1. From particle to fields; 2. Second quantization; 3. Feynman path integral; 4. Functional field integral; 5. Perturbation theory; 6. Broken symmetry and collective phenomena; 7. Response functions; 8. The renormalization group; 9. Topology; 10. Nonequilibrium (classical); 11. Nonequilibrium (quantum); Index.